Eccentric lady feeding pidgeons in a London street. 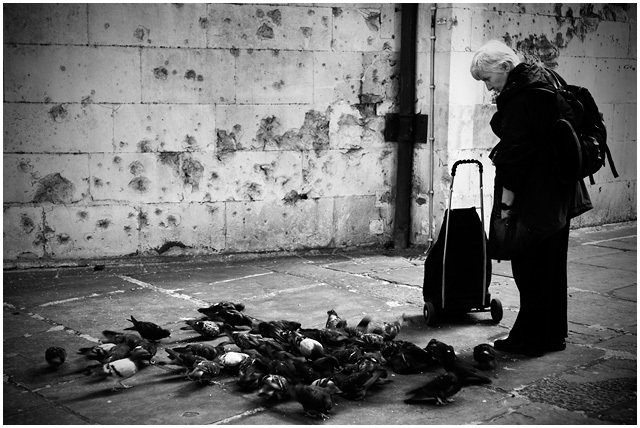 First impression: An interesting image that makes me pause to consider the relationship of the woman to the pigeons. She's standing there passively looking at the birds on the pavement. The pavement is old and worn. The wall looks like it's been shot at by a machine gun...or just pitted by weather and neglect. Where is she? Technically this is a fairly competent image. I like the choice of B&W but wonder if it was actually necessary...even sepia (or some other toning) could have injected some life, some drama(?) into this image. I agree with the commentators who point out the blocked blacks...I don't think the lack of detail in those areas really adds to the image. The vignetting is obvious and, though probably needed to contain the image within the frame, feels a bit over-done. Overall, it's a good image. Had I voted in the challenge I likely would have given it a 6 (as many other voters did) because it is a clean image...there's just nothing else to raise it above average for me. More emotion! More engagement! More story or "reason to be"! Black & White works really good here, well done. vignetting is a little too obvious for me. I don't know why this needs vignetting. I like the diagonal on the wall formed by the decaying concrete. Nice contrast in this, too. My only suggestion is more detail in the shadows. I like the compostion and the story you've captured. Proudly hosted by Sargasso Networks. Current Server Time: 04/26/2019 01:41:17 AM EDT.